Featuring three ensuite rooms and a large lounge in a private wing of the lodge, guests are guaranteed the comfort of a boutique hotel and the hospitality of a home-stay. All three rooms have super-king beds that can be split into twin singles if required. 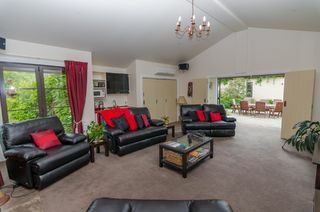 One room hs wheelchair accessible facilities and the lodge is single storey throughout. Guests have private access in and out of the guest wing and there is ample parking to the rear of the lodge. Air-conditioning/heat pumps in each room and an open wood fire in the lounge. Each room has en-suite shower facilities. 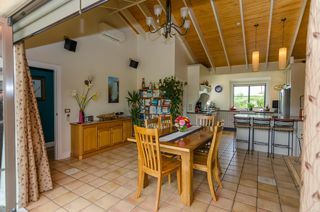 Breakfasts are included and are served in the country-style dinning/kitchen area. Dinners are available on request with minimum 24 hours notice. A maximum of 2 people per room and no children under 16. Click on the photos below for more information on each room. 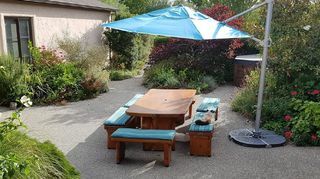 Great morning sun, super-king size bed, en-suite shower room, ranch-slider door to private patio, individual heat pump/air conditioning unit and views to the garden and rolling hills beyond. Access to guest lounge and courtyard. Use of fridge, tea and coffee, home baking and TV/home theatre system in guest lounge. 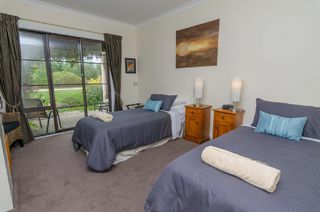 Twin single (or super-king size) bed, en-suite shower room, ranch-slider door to private patio, individual heat pump/air conditioning unit and views to the garden and rolling hills beyond. Access to guest lounge and courtyard. Use of fridge, tea and coffee, home baking and TV/home theatre system in guest lounge. 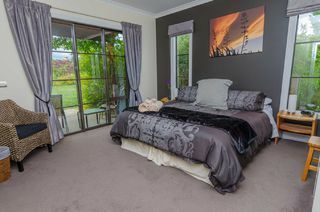 Quiet and peaceful, super-king size bed (can be twin single), en-suite accessible shower room, ranch-slider door to private patio, individual heat pump/air conditioning unit and views to the garden and rolling hills beyond. Access to guest lounge and courtyard. Use of fridge, tea and coffee, home baking and TV/home theater system in guest lounge. Good evening sun. The lounge is exclusively for guest use. Complete with recliner seating, open fire for winter as well as heatpump/air conditioning and large TV and home theater system. There is an extensive DVD library as well as refrigerator and tea/coffee making facilities. Home baking is available. Surrounding the lodge are over 2 acres of gardens. Planted with mainly NZ natives, the gardens were created from what started as a bare sheep paddock in 2009. One of the aims of the property is to be eco-conscious.